If there is anything that can make our inner “nerds” very happy, it is the possibility of faster internet! TELSTRA has tested their world’s first Gigabit LTE mobile network capable of unprecedented mobile broadband speeds. The new LTE technology – which stands for “Long Term Evolution” and is a term used to denote improvements in mobile broadband – means Telstra’s network will soon be capable of download speeds of up to one gigabit per second. Now wouldn’t that be great! At such speeds users could download an hour-long high definition TV show on their phone in less than 20 seconds. In partnership with Netgear, chip maker Qualcomm and infrastructure provider Ericsson, the Telstra network will allow its customers to receive downloads speeds of up to 1Gpbs and upload speeds of 150Mbps over its 4G network. By comparison, the top home broadband packages currently offered by the NBN reach speeds of up to 100Mbps, about one tenth of the peak speeds Telstra says its new mobile network can achieve in “laboratory-like” conditions. However the NBN’s fibre connections will soon boast reliable 1Gbps fixed line connections and be much cheaper than mobile broadband. Telstra impressed media and industry members in Sydney when it tested the network and unveiled a new router to let customers tap into the super fast speeds. 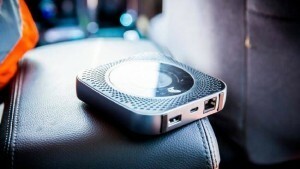 Netgear and Telstra launched the world’s first Gigabit LTE device, the Nighthawk M1 mobile router. According to Telstra, the pocket sized device will allow customers to download a 300MB hour long TV episode in as little as 16 seconds and a 3GB HD Movie in as little as three minutes. The Nighthawk M1 device uses one SIM card and uses multiple 4G bands. It can connect up to 20 devices to the internet at once and will be available in late February for $360 upfront or on a range of plans. In a demonstration for assembled media on Monday to demonstrate the new technology, a computer was connected to Gigabit LTE and performed several tests on speedtest.net, reaching speeds of 900Mbps. “We showcased the incredible customer experience a gigabit class LTE mobile device and network can deliver,” Telstra’s device management director Andrew Volard said in a blog post yesterday. “It’s going help people further embrace a new breed of mobile applications and experiences including immersive virtual reality, connected cloud computing and rich entertainment,” he said. However there is a few things to iron out. At this stage the speeds have only been delivered in “laboratory-like” conditions and, as Telstra admits, will likely be considerably slower in the real world. It’s understood that Telstra has begun to launch part of the network in selected Australian capital city CBDs but it won’t be available throughout Australia for some time. And mobile users will definitely need a bulked up mobile data plan if they intend on taking advantage of the improved broadband, as Telstra has indicated that mobile downloads may cost significantly more than those from a fixed line connection. Telstra said it will look to make gigabit LTE technology available on more devices, including smartphones, sometime this year.